Matt not only understands and coaches our style and philosophy, but has successfully implemented our techniques into his own kicking to make him one of the best kickers out there,” Michael Husted. Kicking Coach Matt Nelson has joined Husted Kicking as Director of the South according to retired NFL kicker Michael Husted, owner of Husted Kicking. Husted says that after a stellar career as a four year starter at Louisiana Tech University, Matt is currently a top free agent prospect for the NFL and will be a great addition to the Husted Kicking team. “Matt not only understands and coaches our style and philosophy, but has successfully implemented our techniques into his own kicking to make him one of the best kickers out there,” says Husted. “Matt will bring a wealth of knowledge and experience to any specialist looking to improve their game." Nelson, who is the owner of Matt Nelson Kicking Academy, has, in the past, worked out for the New England Patriots, the New Orleans Saints, the San Francisco 49ers and the Cleveland Browns. In between workouts, Nelson continues to work with retired NFL kicker Michael Husted to refine his technique and work with students at Matt Nelson Kicking. Nelson says he is looking forward to bringing his skills and experience to his new role as Husted Kicking Director of the South. Michael Husted is a retired 9 Year NFL Kicker. Michael’s consistency on field goals and power on kick offs won him the job as an undrafted rookie. Michael went on to have a successful rookie season where he was named to Football Digest’s All Rookie team. After his NFL career, Michael was involved in an online start up, iPlayers.net in 2005. This innovated site at the time took high school recruiting from “snail mail” to the internet. In 2007, the company was acquired by the Active Network in San Diego, CA. After working in the “corporate” world for a couple of years, Michael realized that one of his passions was helping athletes to leverage their sport for a college education. 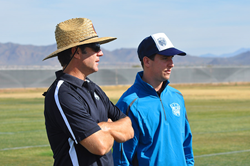 Since that time, Michael founded Husted Kicking, his coaching and consulting business located in San Diego, CA, and the National Camp Series. The NCS platform was designed to objectively measure kickers, punters and long snappers through statistics which takes out all subjectivity in the evaluation process.